Animal Charities- Use our Film to make your Charity Money. Would you like to set up a screening/fundraising event of VICKtory to the Underdog in your city to raise money for your Rescue? You can also purchase our film, VICKtory to the Underdog [http://www.vickdogmovie.com] for $11.oo and sell for $20.oo through your organization to raise money for your Animal Charity. Brandon Bond will sign all copies of the film, purchased for Charity Purposes. We will charge you nothing for showing our film, but we do encourage a small donation to Villalobos Rescue Center [www.vrcpitbull.com]. My mother told me" the only place that success comes before work is in the dictionary. "That is one of my favorite pieces of advice and I have always lived by that. I have worked extremely hard for almost 20 years, sacrificing everything for tattooing. Between the shops in Atlanta,movies,publishing,online retail, and animal rescue, our family of staff has grown to 72 amazing and creative people. To be honest, I'm looking forward to taking some time off this summer. My wife and I just bought a new ranch, and we built the most amazing tattoo theme park for our family of artists and our dogs. In order to enter the ranch you have to climb inside a two-store Japanese dragon, and then you slide down into its belly and it poops you out into the pool. It was based on a traditional Japanese illustration specific to tattoo art- and it's awesome. He prefers the Majors-except perhaps when he's in Philadelphia. That's where hs was heckled mercilessly about his tattoos while hanging out in the bullpen before a game (you can see the video on YouTube). "Those guys are brutal in Philly, they do their research," Moylan says with a good-natured laugh. "The knew things about me that I didn't know about me." "Now I have some real art," he says of his sprawling, colorful sleeves that include a fleur-de-lis and the names of his kids. The elements were included only "on the condition that I give up some blank space for the guys to do something original." So this year, he's going to get something on his back and he's leaving it almost totally up to his artist. "As long as it's not just naked chicks and violence, I'm ready for anything," he says- except perhaps this baseball geek's suggestion that he get tattooed with his stats from the mound at the end of every season until he fills up his back to look like the flip side of a bseball card. It's probably not the aesethetic he's going for, but that's just as well, since Moylan's stats have been a work of art in their own right. He's got a career ERA of 2.45, and opposing batters hit just .231 against him. And though his sleeves will be covered with sleeves on the mound, you won't be able to miss Moylan this year; his unorthodox sidearm release will no doubt help the braves out of many late-inning jams. John: Hundreds. We have clients all over the world that win competitions without sending us the trophy. As far as I know I haven’t received one yet. 2010 may be my year, but honestly tattooing isn't’t about trophies. Pushing yourself and pleasing your client is what makes me feel accomplishment. Jesse James :A Tattooed version of Tiger Woods mixed with Michael Vick PLUS a little Nazi thrown in? The latest Sandra Bullock news is even more sad than the Nazi picture of Jesse James giving a salute and wearing a Nazi hat: Jesse James is now into dogfighting like Michael Vick? That's the news that was mentioned on Entertaiment Tonight and all over the Internet, and it's placing Jesse James image in an even darker place. While the truth of the story is in question, it's out there. 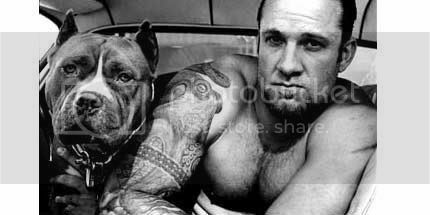 Reportedly, Jesse James allowed two of his pit bulls to fight to the death. But while one blog claims Jesse James took them to a dog fighting ring, another says that's not true and that James' dogs Cisco and Rudy got into a fight while James was not present. Jesse James may have entered rehab to stave off a divorce from Sandra Bullock but that’s the least of his problems as a horrible new scandal has emerged. He’s accused of outrageous cruelty involving his pet dogs! Two of Jesse’s favorite pit bulls fought in a bloody battle to the death - and Jesse’s terrified dog Rudy was ripped apart in the savage attack that tore a leg almost completely from his body. Shockingly, the tattooed TV mechanic treats the vicious encounter as a big joke, charge sources. “Sandra was horrified and in tears when she first heard what had happened to those animals,” said an insider. The unsupervised battle cost Rudy his life, and happened "years ago"
Regardless of this matter, it seems the release of the Nazi photo broke the dam holding back awful information, true or false, about Jesse James. Help us save a victim of cruelty! The good news in all of the bad - this puppy is one of the sweetest girls ever. Despite her incredible pain, she loves to be held and just wants to snuggle and give kisses. She also tries to walk and play, even though her little legs give out after just a few steps. Now we need you to help us continue to help her. More good news - her legs are repairable! Her surgery cost will be about $3000 and recovery / swim therapy will be around another $1000. Once she has her surgery and recovers, the vet expects a full recovery, with no lingering complications. We can't get her out of the shelter and schedule her surgery until we raise enough to cover the cost of surgery. You have all been such wonderful supporters, and I know that $3000 is a lot of money. But, together, we can save these sweet girl. I am asking everyone who reads this to donate $10 and forward to 5 people who you think will also care about this little girl. If we can find just 300 people who care about this little life, we can save her! Will you give up the cost of a pizza to save a puppy's life? Visit her donation page here to help. It was early last season, and pitcher Peter Moylan was doing what he always does during batting practice-- standing in the outfield shagging fly balls. Little did he realize that the wiry, heavily tattooed fan yelling at him was actually a world-famous tattoo artist that desperately wanted to give his arms a makeover! Not a pitching makeover, mind you, but rather just the appearance of Moylan’s arms. Brandon Bond, the owner of All or Nothing Tattoo and Arts Studio, located in the Atlanta suburb of Smyrna, is also a die-hard Braves fan and season ticket holder. He was in the outfield bleachers when his professional eye caught sight of Moylan’s famous “sleeves,” tattoos that run the length of the arm from shoulder to wrist. Moylan looked back at the ‘heckler,’ and tossed a baseball which Bond promptly gave to a kid nearby. Eventually, the two men began talking to each other and by the following day, a promotion package from All or Nothing Tattoo was sitting in Moylan’s locker in the Braves clubhouse. Bond’s not complaining. A twenty year veteran of the business, he loves tattooing and enjoys the creative freedom players give him whether it’s enhancing a tattoo or adding new elements. Certainly, tattoos aren’t for everyone, either because of religious or cultural prohibition or personal taste. Relief pitcher Takashi Saito said that in Japan many health clubs, saunas, and spas ban customers who have tattoos because of its association with the Japanese mafia. Nevertheless, in the U.S. and many other parts of the world, tattooing is perceived as a means of expression and has become more prevalent and mainstream in the past ten to twenty years. In the Braves clubhouse alone, easily half the players have tattoos. Some are elaborate, such as Eric Hinske’s full back tattoo with half-sleeves and chest pieces done in the Japanese Yakuza style. Chipper Jones sported a Taurus astrological symbol on his left bicep for the past ten years, and added a right bicep tattoo this past off season featuring a deer head silhouette and the word “Hood,” his wife Sharon’s nickname. New lefty relief pitcher Mike Dunn has a tattoo of a cross and baseball on his upper back between his shoulder blades. Married players have been known to wear ‘ring’ tattoos on their ring finger since they generally remove their wedding rings when they play. But the tattoos created by Bond are in a different league altogether. A trained artist, Bond’s work could easily adorn a wall, either as a mural or on a canvas, but tattooing is the medium that captured his talent and for that, Moylan is grateful. “I am quite tatted,” said Moylan. In addition to his “sleeves,” Moylan also has the Southern Cross constellation, part of the Australian flag, tattooed on his upper back. “My first tattoo was an eight-ball on my upper left bicep, pretty silly, I know,” he said. From there Moylan added large swaths of dark ‘tribal’ designs, which covered the eight-ball, and his daughter’s names, Montana and Matisse, up the inside portion of his forearms. Moylan’s early tattoos were impressive to the uninitiated, but Bond saw them as a non-cohesive mess. “He basically had two full sleeves of patchy tattoos done by a bunch of different artists,” said Bond. Moylan went to see him in July 2009 during the All Star break for his left arm ‘touch up.’ He wouldn’t have his pitching arm tattooed during the season. With little ‘blank space’ to work with, Bond set about creating a theme that tied the artwork together, adding new elements, like flowers and shading. He also added color and sharpened up edges of existing tattoos. One of the larger and most beautiful new features is a colorful fleur-de-lis on the underside of Moylan’s left bicep. “Pete’s girlfriend Mandy is from New Orleans so that’s a nice tribute to her,” said Bond. Moylan had three re-do session, each lasting between 10 to13 hours. For that sort of time commitment, Bond makes sure his makes sure his celebrity clients are well taken care of in his beautifully appointed personal studio at All or Nothing Tattoo. The studio has a private entrance and looks more like a living room than what comes to mind when you hear the words “tattoo studio.” It features warm colored walls and soothing recessed lighting, a wet bar, comfortable sofas, and several flat screen televisions. When Medlen made his first pilgrimage to All or Nothing during last year’s All Star break, he whiled away the hours in the tattoo chair watching an entire season of the Sopranos on DVD. Medlen arms were significantly tatted, “half sleeves,” from shoulder to elbow, when he visited Bond’s studio. Medlen’s tattoo was a koi, a Japanese carp, and a traditional and popular tattoo. Koi generally symbolize courage and overcoming challenges to attain your goals, but symbolism wasn’t behind Medlen’s thinking. When Medlen heard about Bond he decided to have him add color and other flourishes to take his existing tattoos to the next level. Medlen is pleased with the finished product, the formerly non-descript black ink tattoo now looks like a true Japanese-inspired tat featuring a colorful koi swimming in blue waves with coral colored leaves. There were other unimpressive elements to his tattoo, stars and banners, but with Schafer’s arm, Bond had a little more room to express his artisanship. Schafer didn’t want color, he wanted all the work to be black ink, which gives the piece a distinctly ‘old world’ feel. The finished piece is stunning. It features delicate swirling clouds and two angels, male and female reaching out their arms to each other, the serene face of the Madonna on the underside of the bicep, scrollwork with aged and curling edges surround the quotes, and stars framed in angel’s wings appear to point heavenward. The attention to detail is breathtaking. Shading gives the work movement and dimension and it’s easy to imagine the same piece laid out flat on a canvas hanging in a gallery. Schafer estimated the total time tattooing was between 30 and 40 hours, all performed in increments, of course. By contrast, Bond’s tattoo on Prado, also done during last year’s All Star break, was a walk in the park. “It was the smallest tattoo I’ve done in probably six years,” said Bond. Prado got a black ink Florentine-style cross, probably 7 to 8 inches in length tattooed on his left bicep. In the center of the cross is a star with a script “M,” in honor of his two grandfathers, Martin and Manuel, for whom he’s named. The cross looks as though it has wings, and there are rays of light over the top point. Prado was concerned about his ability to swing a bat after he got the tattoo but was reassured that his arm would heal up just fine, and in fact, he never missed a beat after getting it. After care for a tattoo varies according to the artist but Bond recommends his clients keep the tattoo out of the sunlight, wrapped in plastic wrap for several hours, then clean it several times a day with mild soap and warm water, and finally lightly apply a special ointment called H2Ocean. The ointment is used until the tattoo begins to peel, like sunburn. And Moylan is giving Bond absolute artistic control over the art. Priority one for Bond, though, is finishing up Moylan’s right arm which can’t be done until the end of the season. Follow Dave Tedder on Twitter: http://www.twitter.com/davetedder and follow his journey through the UK. Do you Know the story of ANNIE OAKLEY? All or Nothing Pitbull Rescue has teamed up with Atlanta Animal Rescue Friends. After contact with Susan from AARF, Brandon Bond learned that a beautiful female chocolate pitbull,whom was extremely underweight, was scheduled to be euthanized in a few days. After making many attempts to get her into a set home, Brandon decided to rescue her,Annie Oakley, as part of his birthday present. Annie Oakley was scheduled to be put down before we rescued her. She is a loving and affectionate dog who was looking for a family.